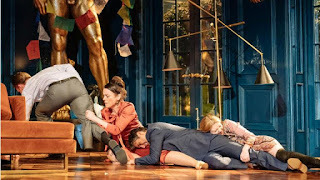 Last Monday night Stuart and I went to see John Donnelly's modern reworking of Molière's controversial comedy Tartuffe at the Lyttleton Theatre on London glitzy South Bank. Originally written in 1664 Tartuffe is a savage attack on the pious. And very funny it is too. In fact, Tartuffe courted controversy from the get-go with the Archbishop of Paris issuing an edict threatening excommunication for anyone who watched, performed in, or even read the play. The Archbishop hated the fact that the play presented someone who was outwardly pious but fundamentally mercenary, lecherous and deceitful and who uses their profession of piety to prey on others. He seemed to object to the self-delusion and hypocrisy of the self-professed 'good'. I can't think why! Cleverly rewritten and updated as Tartuffe The Imposter, the play see our eponymous anti-hero played by Denis O'Hare worm his way into the affection and Highgate home of head of the household Orgon (Kevin Doyle, yes, him off of Downton Abbey) and his aging mother Pernelle (Susan Engel). Here our Tartuffe is not a total fraud though - but perhaps a genuine, streetwise shaman who is simply on the make. He plays up his piety when he seems how well it is going down. However, it is not all plain-sailing for our imposter. This Highgate cuckoo causes much ire from Orgon's willful wife Elmire (Olivia Williams), his dotty son Damis (Enyi Okoronkwo), his ditzy daughter Mariane (Kitty Archer), his knowing housemaid Dorine (Kathy Kiera Clarke), and frustrated brother-in-law Cleante (Hari Dhillon). Oh and let's not forget Mariane's true love socialist poet Valère (Geoffrey Lumb) whose dreadful poetry chimes with the statement, "rhyme is a bourgeois concept." The whole piece is played as a broad farce with many topical references. It had the feeling of a pantomime mixed with a Restoration comedy. These topical references include the world of Brexit and of Donald Trump. Tartuffe might be feigning his piety but Orgon is motivated not so much by religious mania as by a false nostalgia. 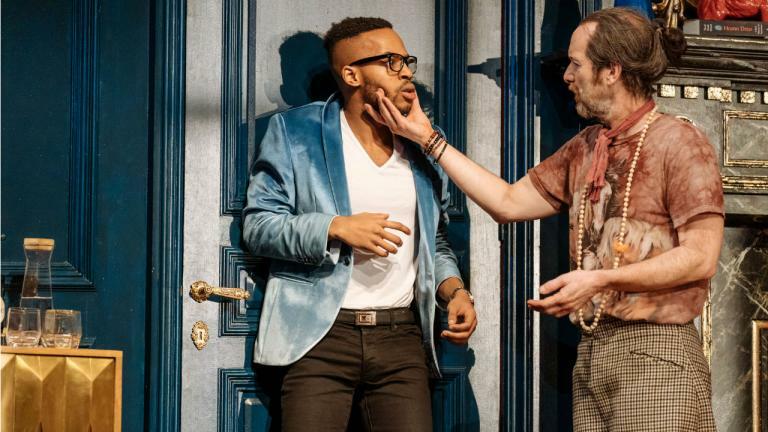 He explains, "That's what Tartuffe is offering, a return to a time when things meant something, where there was love and kindness, not cruelty and selfishness." He all but says, "Let's take back control." Blanche McIntyre's production is light and airy however and never dwells too long on the political. Instead, it simply brings out the satiric comedy of the action – thereby still being subtly provocative but also downright, riotously entertaining too.